A few weeks ago, I wrote about a freeform peyote bracelet I created and referenced an amulet bag I had created years ago that inspired the bracelet. Here is the amulet bag. I did some experimenting with hanging the bag within my light tent. My kit came with some hanging clips so I hung the bag from the clips so I could take a photo with the fringe hanging naturally and freely. The sea glass I encased on the front of the bag was found on a beachcombing expedition when I visited Maui a couple of years ago. I added that on after the bag was finished. 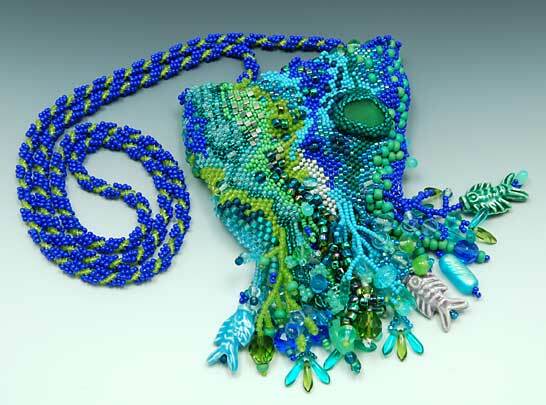 The ceramic fish and seahorse beads were purchased during a trip to Nantucket. The strap is done in a spiral stitch. It took many hours to finish the bag over the course of 4 years, working on and off during a challenging time in my life. 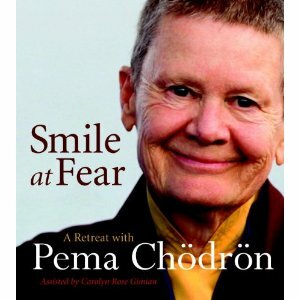 So, the freeform peyote technique and its meditative qualities will always represent healing to me. Maybe that is why I’m drawn to it so much. This entry was posted in Beads, Color, Creativity, Inspiration, Jewelry, Nature, Travel and tagged amulet bag, freeform peyote, spiral stitch. 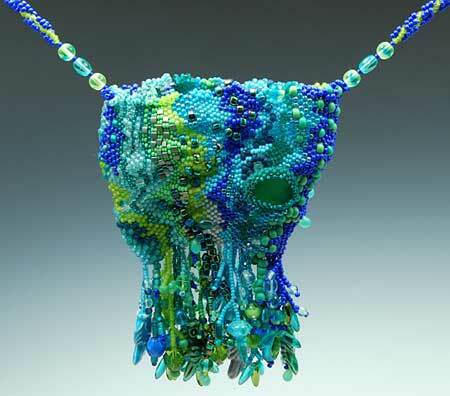 Karen, your beadwork is always stunning, as is this piece ! Wow, four years, that’s a long time to work on one project. I love the blues and greens, they say ‘ocean’, ‘serenity’, and ‘contemplation’ to me. Thanks Dora, those are some of the things I was meditating on while I was beading the piece. I love beading in this freeform way because you definitely enter into the universal flow and just hang out there in each beading moment. it is breathtaking, karen – absolutely gorgeous. too, the photography really captures the detail, in what i am assuming is its true color – that is what i have trouble with when using my light box. i rarely use it because of that! Karen.. I don’t think there is anything you create that I don’t love. This is beautiful! Just beautiful!